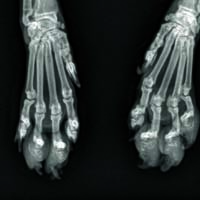 In this Radland, Alan Lipman, DVM, DACVR, examines a case of swollen toes in a cat and makes a surprising connection. A 12-year-old DMH feline presented to DoveLewis with a two week history of difficult ambulation. The distal aspect of the digits of all four limbs were severely swollen, painful and appeared necrotic. There was exudate involving the majority of the nail beds of all four limbs. Radiographs of the distal thoracic limbs were performed and are included for evaluation. What are the radiographic findings and likely differentials? Are any other imaging studies warranted based on this appearance? There is severe soft tissue swelling surrounding the distal aspects of digits 3, 4 and 5 bilaterally. There is also lysis involving the majority of the distal phalanges of these digits as well as digit 2 bilaterally. No other radiographic abnormalities are identified. These findings are consistent with an aggressive process involving multiple bones. A metastatic neoplastic process would be most likely given the lack of a travel history in this patient. Primary neoplasia or osteomyelitis would be unlikely given the multiple digits affected. Metastasis of primary pulmonary neoplasia to the digits of cats is a known entity which warranted thoracic imaging in this patient. A large circular soft tissue mass measuring 2.9 x 2.6 cm was identified involving the caudodorsal thorax. This most likely reflected a primary pulmonary carcinoma. Unfortunately, the patient was euthanized due to a poor prognosis and severity of clinical signs. Metastatic digital carcinoma in a feline patient secondary to a bronchogenic carcinoma has been shown to affect multiple digits in one or more distal limbs. This process has often been described as ‘lung-digit syndrome.’ Digital swelling involving one or more sites would therefore warrant thoracic radiographs in a feline patient. This process has not been described in the dog to the authors’ knowledge.